When I look at the photo, and joy is unrivaled by any set of jingling bells. The intimacy would melt all the snows of winter. No wrapping could contain the beaming smiles. No tinsel could outshine their eyes. Who needs a white beard when you look at that golden hair? The composition of the three of them deserves an angel on top. And what sleigh could hold a candle to those two arms straddling the pair of carousel riders? Lights? Are you kidding? 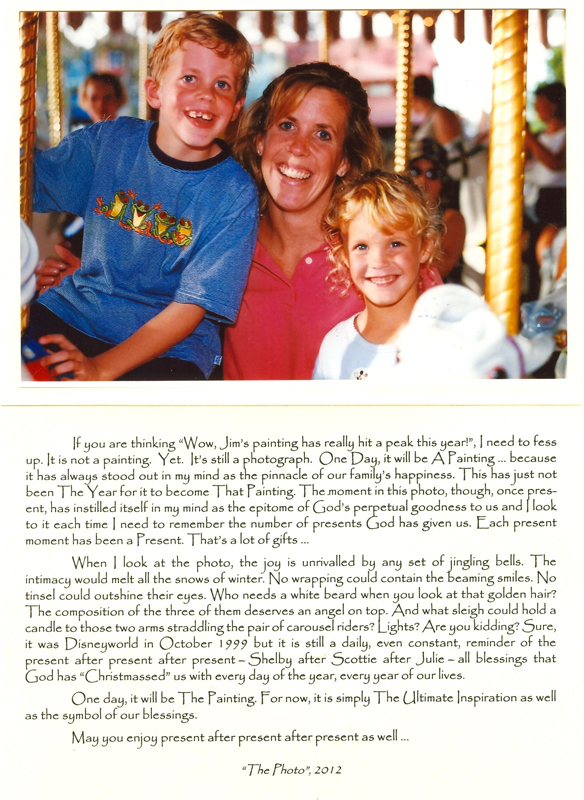 Sure, it was Disney-world in October 1999 but it is still a daily, even constant, reminder of the present after present after present – Shelby after Scotty after Julie – all blessings that God has “Christmassed” us with every day of the year, every year of our lives. One day, it will be The Painting. For now, it is simply The Ultimate Inspiration as well as the symbol of our blessings. May you enjoy present after present after present as well…..
© 2019 Jim Kuhlman Fine Art.